Outside Bolland’s Judge Death work, the Cursed Earth is arguably the most reprinted Dredd story, but it’s never actually been complete. Until now. Four chapters of the 1978 epic (episodes 11-12 aka Burger Wars and episodes 17-18 aka Soul Food) ran foul of the lawyers due to a casual attitude on editorial’s part to copyright, with less-than complimentary appearances from The Jolly Green Giant, Ronald McDonald and other iconic American properties. Now, after nearly 40 years and a change in the laws regarding satire, we can finally see what we have been missing. The question is, was it worth the wait? 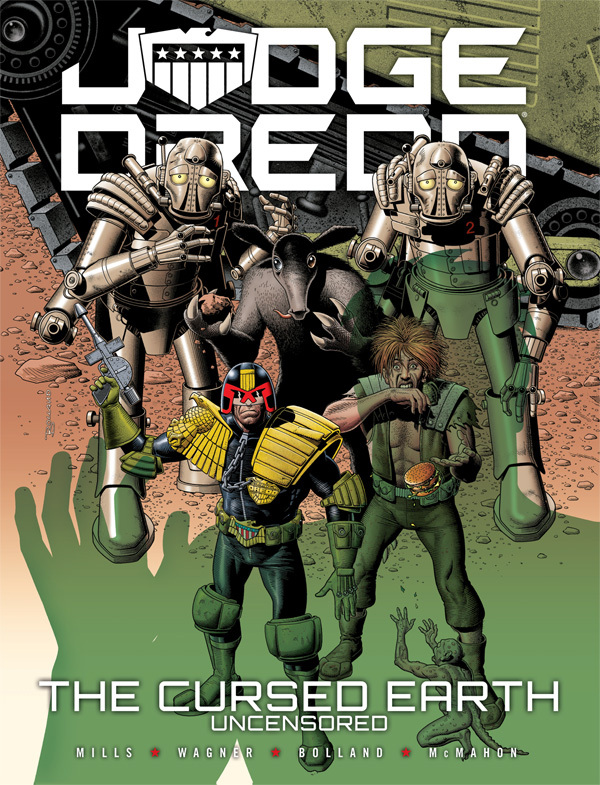 The Cursed Earth is a classic, no doubt about it (take a look at my review of the censored version for context), but it’s always been one of the lesser Dredd epics due to its episodic nature. Unlike The Day The Law Died, The Apocalypse War or Necropolis, its overall arc is merely a framing device for several mini stories, with Dredd facing off against insane mutants, vampire robots, rabid dinosaurs and more. If that sounds like a ton of fun, that’s because it is. A sprawling road movie through the post-nuclear hell that used to be the USA, The Cursed Earth was the first proper Dredd epic, and it still stands up today. Deftly balancing action with humour, social commentary and satire, it was this second year of 2000AD when Old Stoney Face stepped up as the main draw in the comic, a point he’s occupied ever since. Oh course it helps massively that Pat Mills (with occasional help from John Wagner) is drawn by two of the definitive Dredd artists, Mick McMahon and Brian Bolland. Every single page (if not every single panel) is an absolute joy and sets a marker for everyone that followed them. But everyone knows all that. What about the “new” material? Well, it turns out they’re both bordering on inessential as far as the story itself goes. Burger Wars is as slight as stories go. Dredd and the team get captured by both the McDonalds crew and their bitter rivals, led by the Burger King. Then they escape. That’s it. Saying that, it’s a fun diversion and McMahon’s art is spectacular as usual, so it’s a success regardless. The Jack Adrian-scripted Soul Food is equally slight, but goes even more hell for leather with the copyright-baiting, with a thinly-veiled Colonel Sanders creating talking Alka-Seltzers, monocled peanuts and Jolly Green Giants all creating an intellectual property Island Of Dr Moreau. Again, there’s not much to it, but the art is just sublime, with Bolland firing on all cylinders as usual. If you were going to lose any chapters from The Cursed Earth, it would have been these ones, no doubt about it. There’s not much to them and the satire is a little too on the nose, even for early 2000AD. That doesn’t matter though, as the story is finally complete and it’s all the better for it. Four classic episodes of McMahon and Bolland art restored to their rightful place? Great review – thanks! I’ve been trying to get a look at a preview of the artwork in this volume for ages. What is it like? (Also is it in colour – I’m not sure how old the Cursed Earth stories are) . Thanks again!